I am An Rong, but at Starbucks, I'm Aaron or Ani, depending on how I feel. I am an American with a complicated family history that starts in China. Grew up watching The Mighty Morphing Power Rangers and Baywatch with my Grandfather. Currently in NYC, but flirting with the idea of elsewhere, I'm taking offers. At the age of 2, I took a 10,000 mile journey from Taishan, China, to Mulberry Street in Chinatown, New York. Grew up there for a bit, and then moved to Queens, where the New York Mets taught me the hardest things in life, how to deal with heartbreak and just because it has syrup on it doesn't mean it's pancakes. I am a documentary photographer, filmmaker, and sensitive artist. At the moment, I'm all about long thoughtful conversations, finding oneself, long journeys, making the best of every situation, good soul food and romantics. When not thinking about those, my long term goal is to tell the story of the Chinese American people through my photographs and to eventually fall in love. 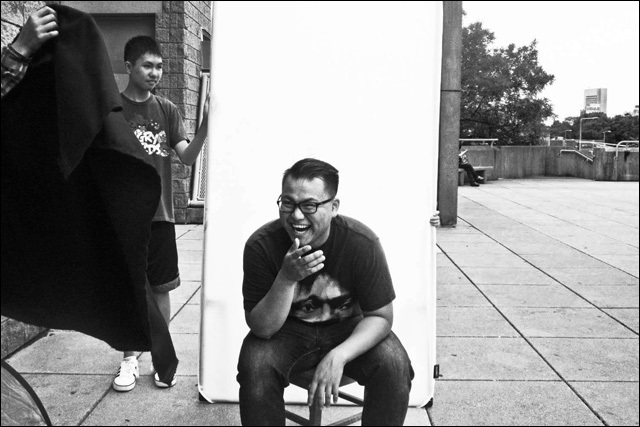 I'd also love to start making more films with Asian American talent, holla at your boy. Nothing makes me more angry than ignorance, misplaced items, and bad penmanship. Ain't having none of that up in here! Check out An Rong's work at AnRongXu.com and follow him on Instagram @AnRizzy.